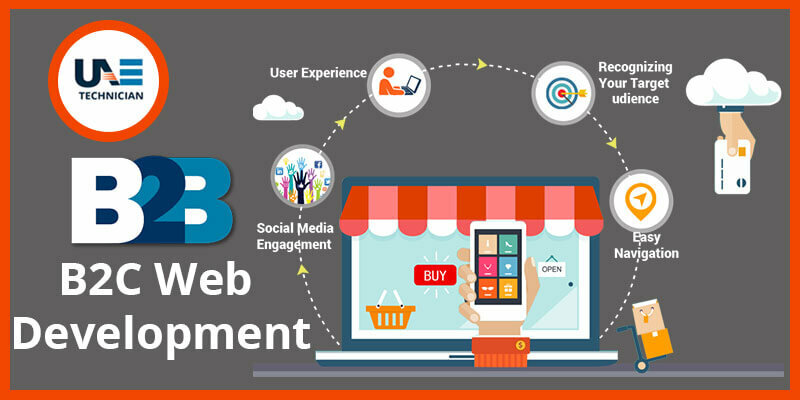 B2C web development is a method of developing dynamic websites to attract your consumers with unique designs and catchy contents. It is the perfect combination of customized web development and digital marketing. B2C web designing allows you to interact directly with your customers and vice versa. It offers you several catchy designs and attractive punchlines to reach your potential buyers and ensure sales. Business owners design their own B2C sites to sell products or services to their customers. They are ready to invest a huge amount of money in developing innovative B2C sites to earn maximum returns. Are you searching for B2C web development services at a reasonable price? Your search will definitely end with us. Our professionals at UAE Technician are highly skilled and can design your B2C website in the most innovative way. Reach our professionals via call, email or chat and let us design an exclusive B2C website for you to increase your sales volume. How B2C web development can help you to grow your business? Online media and e-commerce are renovating the way for consumers to learn, choose and purchase products and services. B2C web development is the best method for business enterprises to explore growth opportunities. It offers convenience and comfort of shopping to the customers which leads to an increase in the business volume of the parent company. Additionally, it helps to develop your brand image around the world. Check out the multiple benefits of designing an innovative B2C website. Convert your current static website into an appealing B2C website today. It will help you to invite, engage and convert traffic into customers through its rich designs. It will also provide you with maximum competitive advantage. We offer the most reliable B2C web designing services in Dubai on a budget which suits your pocket. Our experts at UAE Technician design your website with attractive features and trendy styles. They have worked on several B2C projects for more than a decade. Thus, they can guide you in the best ways to design your B2C website in the most catchy manner. We always try to ensure that you achieve maximum success in your business by availing our website designing services. Our experts take pride in offering advanced services. Tired of searching for affordable B2C Website Development in Dubai over the internet? Connect with our professionals today and avail our best in class services at a pocket-friendly price. Give us a call at our helpline number: 042053349 to reach with our experts and avail thorough guidance from them. Our experts at UAE Technician are also available over live chat option via which you can talk to them in real-time and avail instant guidance. Stay in touch with us to avail the best service for B2C web designing in Dubai. We also provide Portal development service in Dubai.